Guava is full of vitamin A, C, folic acid, fiber, copper, potassium and manganese. Studies have shown that one guava fruit contains about four times the amount of vitamin C, as that of an orange. 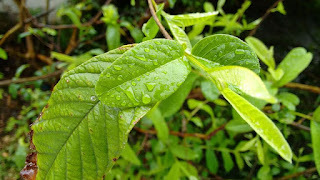 Guava leaves are used for natural medicine in tropical countries. Its leaves contain various beneficial substances, such as vitamin B, C, antioxidants, and flavonoids like quercetin. These nutrients are what makes guava leaves beneficial for skin and hair problems. So Why are Guava Leaves Good for the Hair? According to experts, guava leaves can prevent hair fall and hair loss when regularly used as a part of your hair care regimen. The main reason for this is because its leaves are rich in vitamin B, which is an essential vitamin that protects the hair health. 1. Boil a handful of guava leaves, using 1 liter of water for at least 15-20 minutes. 2. Once boiled, let it cool down to room temperature. 4. Apply gently on your hair, starting from the root to the tip. Concentrate on the roots of your hair and scalp.